COMPASS Wealth Management, LLC is a fee-only firm—we receive no commission-based or transaction-related compensation. Our fee is determined by the amount of assets we manage on your behalf, which aligns our interests with yours—to manage and grow your assets. You will find our fees to be very competitive. Our fee schedule for Wealth Management Solutions begins at only 1.00% of your portfolio's assets annually, and as your assets increase, your rate decreases. Our fee is inclusive of all the services we provide you, unlike some other providers. 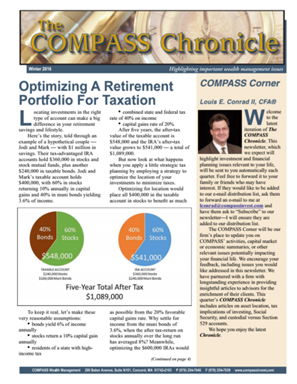 We do not charge additional fees for the preparation of a retirement planning analysis, for example. The fee schedule is normally subject to a $2,500 minimum annual fee. The Wealth Management Solutions fee is independent of, and in addition to, any fees and expenses charged by mutual fund companies, third-party investment management firms, or the independent custodian. A complete explanation of expenses charged by each mutual fund is contained in its prospectus. COMPASS Wealth Management, LLC is always pleased to provide you with information regarding any fees and expenses charged by these companies.